I started out this morning as I do every morning. I brushed my teeth, tamed my unruly hair, put on comfortable clothes, laced up my shoes, and headed out for my morning walk. However, there was something different this morning. After about ten minutes I realized that I was consumed with worries. My ears and eyes were closed to what was going on around me. I had forgotten to live in the moment. So I stopped and took a moment to just breathe, to look around at the beautiful summer flowers, and to listen to the cries of the birds. I immediately felt a sense of serenity fill my body and calm my worried mind. I remember, as a child, my grandmother would tell me that worry would not add a day to my life. How wise she was. We cannot know what the future will bring to us, and we cannot bring back moments from the past. We only have this moment, and in this moment we have to learn to live fully, to fnd a sense of acceptance and serenity. Notice your moments today. Every step you take can be filled with peace, joy, and serenity. P.S. Find more Inspiration On A Monday here. a very good reminder. i inherited my mother's penchant for worry and need to interrupt that cycle now and then. The moments are most precious of all. I've had a very stressful week and I, too, found that just taking a break from it, sitting outdoors and taking time to breathe, put me in a much calmer place. Thank you for sharing, Laura! hope you visit my blog again! take care.. There is so much to be grateful for, especially in the summertime when we have wonderful reminders. Sunny skies, singing birds, gorgeous flowering plants, etc. Have a beautiful day, Laura. Great post Laura. So true it is so easy to go in the worry direction in life so the fact you realized that and changed up to live in the moment is awesome. You go girl with your walk and enjoy the beauty around you. I think it's inevitable that we all worry from time to time. It's a good reminder to live in the moment. But, sometimes, worry can be beneficial. Only when it's used to prompt you to make changes in your life that are causing the worry! Then (and only then) does it become a good thing. Otherwise it's a waste of time and can just make you sick. I am a worrier and your grandmother was a very wise woman. My husband tells me something similar! 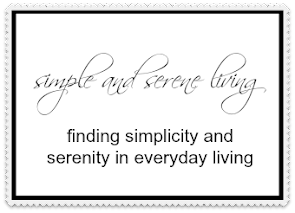 I try to find a little peace and serenity in every day! Some days are harder than others....lol! Enjoy your moments Laura! 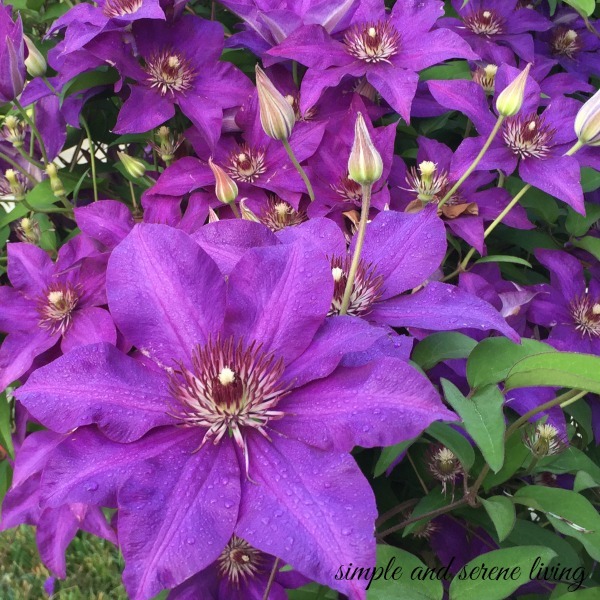 I love your clematis picture Laura. It's beautiful! Perfect words for me lately and a beautiful post.